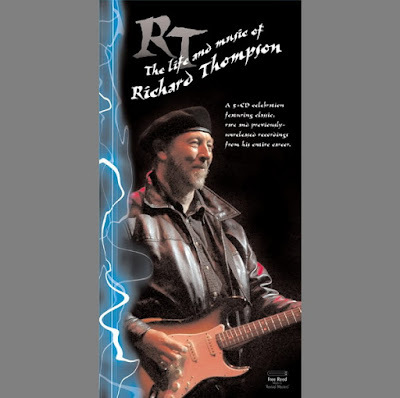 Given the length, breadth, and impact of his career as, arguably, the most revered figure in British folk-rock since he first joined Fairport Convention in 1967, it's no surprise that Richard Thompson has been honored with the multi-disc box set treatment not once, but twice. In 1993, noted Thompson, aficionado Edward Haber compiled Watching the Dark, three CD's worth of album cuts, unreleased studio outtakes, and rare live performances which offered a detailed chronicle of Thompson's career in music. However, not all fans were entranced with the set, and Neil Wayne and Nigel Schofield of the noted British folk label Free Reed Music sought Thompson's participation to create RT: The Life and Music of Richard Thompson, a massive five-disc set culled primarily from unreleased recordings taken from Thompson's own archives and accompanied by a 168-page book which includes an exclusive in-depth interview with the man himself. While RT is obviously a tremendous labor of love and a powerful testimony to Thompson's genius as a songwriter and guitarist, compared to Watching the Dark it's something of a disappointment. While the notion of five CD's worth of rare and unreleased Richard Thompson recordings is enough to make nearly any loyalist salivate, nearly all the cuts are live tapes of highly variable recording quality; though most sound "fresh off the board," an uncomfortably high percentage are scarred by noticeable technical anomalies (in particular boomy audience recordings and distorted radio broadcasts), and the 1972 recording of "The Great Valerio" from a Richard & Linda Thompson concert would barely be acceptable even by bootleg standards. (In all fairness, the booklet acknowledges the poor quality of the latter recording.) Also, given Free Reed's leanings as a folk imprint, it's not surprising the set leans heavily on Thompson's solo acoustic performances rather than his electric full-band repertoire, and while the solo stuff here is almost uniformly splendid, the proportions are certainly off in terms of giving an accurate picture of his body of work, especially disc three, which promises a set of "Epic Live Workouts" but which leans towards acoustic numbers with extended solos rather than the electric explorations that are truly Thompson's most remarkable live achievements. And though Nigel Schofield's liner notes offer an intelligent and impassioned appreciation of Thompson's work, the notes on the tracks themselves are less impressive, and the details on the source materials are often lacking or simply inaccurate (there are no Who covers on any of my copies of Shoot Out the Lights, no matter what Schofield says). None of this should suggest that RT isn't worth a listen -- simply put, Richard Thompson is one of the finest singers, guitarists, and songwriters to emerge in the second half of the 20th century, and there are dozens of dazzling examples of Thompson in full-flight here. Even when the audio is faulty, the performances are sterling, and there are a number of genuine rarities on-board, particularly on disc five, which features precious studio demos of a number of unreleased songs, including the haunting "Bad News Is All the Wind Can Carry," "Shady Lies," and "In Over Your Head." For all its flaws, RT: The Life and Music of Richard Thompson will leave no one with any doubt about the strength of this man's talent. Obsessive fans will find much to revel in, but overall RT seems like a grand opportunity that didn't quite pan out, despite a wealth of good intentions. If you like the blog and want to support the author, then you can contact the form below. The Rolling Stones - Houston Can You Sing!